The Algonquin Park Visitor Services Program celebrates its 75th anniversary during 2019. In recognition of this milestone The Friends of Algonquin Park in cooperation with Ontario Parks is celebrating by hosting a Visitor Services Reunion for past and current staff (and immediate family members) from September 6 to 8, 2019 in Algonquin Park. This reunion is only for individuals who meet the criteria below. Individuals who have been Museum Technicians, Naturalists, Trail Crew, and a host of other positions within these facilities for either The Friends of Algonquin Park or the Ontario Government. Registration is now open for the 2019 Algonquin Park Visitor Services Reunion. All attendees and immediate family members need to register to attend. Entire "weekend" and "Saturday only" priced packages are available. Registration closes August 16, 2019. Click the button to register after reviewing the details below. Below is an agenda for the 2019 Algonquin Park Visitor Services Reunion. Please check back regularly for updates to this agenda as more events are finalized. Events marked with * are selections required by participants on the registration form (see link above). The Algonquin Park Visitor Centre opened in 1993 to celebrate the 100th anniversary of Algonquin Provincial Park and the entire Ontario provincial park system. The Visitor Centre has world class exhibits on the Park's natural and human history, a relaxing restaurant and an excellent bookstore. A theatre presentation sums up the Park story and then takes you out to the viewing deck from where you can admire a breathtaking panorama of wild Algonquin landscape. The Algonquin Park Visitor Centre is also the headquarters of The Friends of Algonquin Park and the Natural Heritage Education Program. The East Beach Picnic Pavilion is a covered picnic facility suitable for 110 people frequently used for weddings, family reunions, business meetings, training courses, special events, and school group outings. Washroom facilities are available in the immediate vicinity. Located south from km 35.4 of Highway 60, the Outdoor Theatre is an open air amphitheater, with bench seating for 1,000+ people, used for evening programs, special events, and Algonquin Park's famous Public Wolf Howls. Other events will be taking place at numerous locations along Highway 60. Details will be provided upon registration in Algonquin Park. 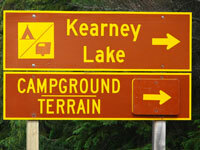 Camping at Kearney Lake Campground is available for those registering for the reunion weekend. Registrants must indicate on the registration form if a campsite is required. Campsite availability is limited and is available on a first-come, first-registered basis. Additional camping opportunities exist apart from Kearney Campground (see below). Camping opportunities (alongside the public) exist apart from the Kearney Lake Campground. These developed or backcountry campsites can be reserved through the centralized Ontario Parks reservation service, for an additional charge, and can be booked up to 5 months in advance. For more information see Fall in Algonquin Park. Please make you own accommodation arrangements early to avoid disappointment at this busy time of year. Plenty of roofed accommodation is available both inside and outside Algonquin Park. Options vary but include lodges, yurts, and providers in neighbouring communities such as Whitney, Oxtongue Lake, Huntsville and beyond. See the Commercial Services section for providers by searching "accommodation" in the search box. During the 2019 Visitor Services Reunion we are in need of volunteer field excursion leaders and assistants. If you would like to volunteer with a field excursion, please contact us. If you have taken images in Algonquin Park of yourself and your coworkers and would like to share them with The Friends of Algonquin Park for use at the Visitor Services Reunion, please submit them along with your registration package, or if not attending, send them to Stacey Finch at The Friends of Algonquin Park. Can't Make It To the Reunion? Even if you can't make it to the reunion you are welcome to share your images and best wishes to be shared with attendees. Please send them to Stacey Finch at The Friends of Algonquin Park. For more information about the 2019 Algonquin Park Visitor Services Reunion please contact us.